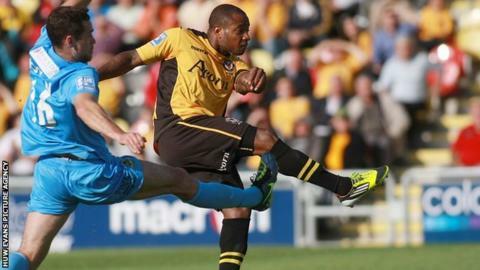 Ben Swallow's stoppage time winner at Rodney Parade maintained Newport County's place at the top of the Blue Square Bet Premier table. Swallow found the top right corner from 25 yards to complete a County comeback. A Chris Lever penalty, given for a Shaun Whalley foul by Andy Sandell, had put Southport ahead on 18 minutes. Three Newport penalty claims were ignored before Aaron O'Connor's lobbed second-half equaliser, and then Swallow delivered a spectacular winner. "Credit to Southport, they came and set about us early and we were on the back foot. "I think what we've shown is we've got a good group here now and have overcome that and gone on to win the game. [I'm] absolutely delighted. "The quality that we have brought from the bench has changed the game for us."